Le Club AccorHotels has launched triple miles offer for Etihad Airways frequent fliers. Etihad Guest members can earn triple miles for stays that are both booked and consumed between October 15 – December 31, 2015. Note that you must have your Le Club AccorHotels earning option set to miles and have Etihad Airways Guest as the preferred partner. One Le Club AccorHotels members that has chosen Etihad as their conversion partner during the offer period will receive 50,000 miles. Another Le Club AccorHotels airline bonus miles offer to keep in mind. I don’t usually take advantage of these unless there is additional bonus from the airline or fixed number of bonus miles offer from Accor. 1. 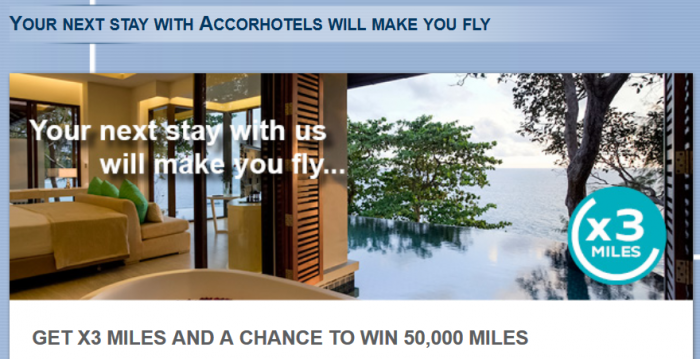 General Le Club Accorhotels terms and conditions apply to the “Your next stay with AccorHotels will make you fly” offer. 2. This offer is valid for a stay from 15/10/2015 and 31/12/2015 in one of the participating hotels worldwide, and booked between 15/10/2015 and 31/12/2015. 3. This offer entitles Le Club Accorhotels Loyalty members, regardless of their status, to benefit from earning X3 per eligible stay in one of the participating hotels worldwide. 4. To benefit from this offer, your booking must be made on Accorhotels.com, direct hotel, GDS, OTA at a corporate rate, our participating brands web sites or via Accor call centers. All other reservation channels will not be eligible to this offer. 7. The bonus will be credited in Le Club Accorhotels points within 10 days following the end of his/her stay and converted into Etihad Guest according to applicable conversion rule. 8. In order to benefit from this bonus, the member must have activated Etihad Guest as preferred conversion option ahead of the stay. 12: The lucky winner of 50,000 Miles will be picked up randomly at the end of the period among all the eligible members of the bonus above mentioned. The winner will be contacted via the email address provided during his/her enrolment within Le Club Accorhotels loyalty program.